At MWMCA we can help for a low affordable cost. On our weekly e-newsletter that goes out to over 20,000+ subscribers, we advertise your bid opportunity until it expires and it includes amendments and extensions at no additional cost. It appears on the Bid Opportunity section on our website and on our weekly e-newsletter that is viewed by many minority businesses not only in Maryland but nationwide. 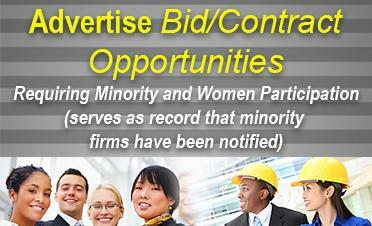 This also serves as a record that your company has notified minority and women-owned firms. We can target specific groups of minority businesses that you are trying to reach because our database is categorized according to the products/services a company provides. 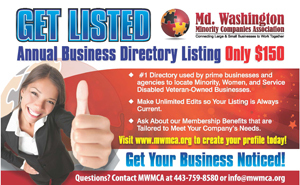 Contact Us at 443-759-8580 or email us at info@mwmca.org to get current rates.